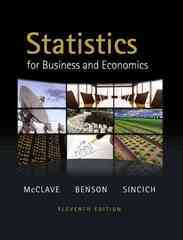 Statistics for Business and Economics 11 Edition Classic, yet contemporary. Theoretical, yet applied. Statistics for Business and Economics, Eleventh Edition, gives you the best of both worlds. Using a rich array of applications from a variety of industries, McClave/Sincich/Benson clearly demonstrates how to use statistics effectively in a business environment. The book focuses on developing statistical thinking so the reader can better assess the credibility and value of inferences made from data. As consumers and future producers of statistical inferences, readers are introduced to a wide variety of data collection and analysis techniques to help them evaluate data and make informed business decisions. As with previous editions, this revision offers an abundance of applications with many new and updated exercises that draw on real business situations and recent economic events. The authors assume a background of basic algebra.